Jean-Léon Gérôme (1824–1904) was the most publicly honored and financially successful French artist of the second half of the 19th century. His Orientalist scenes were inspired by the many voyages he undertook to Egypt, North Africa, Syria, Asia Minor, and the Holy Land over the course of his career. 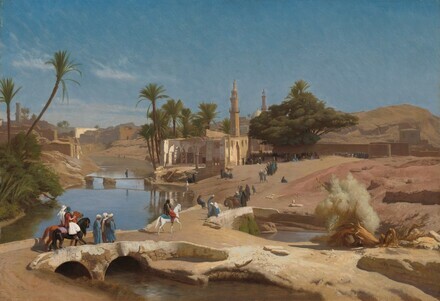 In View of Medinet El-Fayoum, c. 1868–1870, Gérôme depicts the oldest city in Egypt, located some 80 miles southwest of Cairo. Unlike many Orientalist pictures of the day—fantasies constructed in a Parisian artist's studio—this painting is informed by empirical records, while maintaining a sense of the awe and mystery Egypt inspired in French visitors. While the Gallery owns a drawing and two prints by Gérôme,View of Medinet El-Fayoum is the first painting by the artist to enter the collection. Purchased with the Chester Dale Fund, it joins a small group of Orientalist pictures in the West Building's recently renovated 19th-century French galleries, including Delacroix's Arabs Skirmishing (1862), Renoir's Odalisque (1870), Benjamin Constant's Favorite of the Emir (1879), and Matisse's Odalisque (1923). Millard F. Tompkins, Esq. ; (sale, American Art Gallery, New York, 5 March 1915, no. 27); Ruppert. private collection, Maryland; (sale, Parke-Bernet Galleries, New York, 17 October 1956, no. 52). Woodford; P. Tretyakov. Sordoni collection, Wilkes-Barre, Pennsylvania. (Mathaf Gallery, London), 1978; sold 1982 to private collection; purchased 14 June 2013 through (Galerie Arnoldi-Livie, Munich) by NGA. The provenance given here is based on Gerald M. Ackerman, The Life and Work of Jean-Léon Gérôme, with a catalogue raisonné, London, 1986: 228, no. 205. This is probably the collection of Andrew J. Sordoni [d. 1963], Pennsylvania state senator and founder of the Sordoni Construction Company. Thornton, Lynne. The Orientalists: Painter-Travellers 1828-1908. Paris, 1983: 116-117, repro. Ackerman, Gerald M. The Life and Work of Jean-Léon Gérôme, with a catalogue raisonné, London, 1986: 228, no. 205. Morton, Mary. "Jean-Léon Gérôme, View of Medinet El-Fayoum." National Gallery of Art Bulletin no. 49 (Fall 2013): 20, repro.